I wish I could find the right words to express how uncomfortable it makes me feel. It’s like some kind of cult or something. “The Cult of Obama” Obama-Mania. People are all frenzied, teary eyed, gushing like they are having orgasms over him. That last campaign with the Obama girl was really over the top. What is that? Why do people need to idolize him? How is that cool for a thinking, educated, civilized nation of people? What if they did that to Bush, whom they clearly did not like. What if the Tea Party wrote songs about John Boehner? Okay, political parody, satire, or even cartoons, but this romanticizing of the President is a bit much for me. They are so memorized they care not to look at the true picture, the real deal and that means they are dangerous. That Obama Kool Aid is really powerful. Is this really poetic license or is it opportunism? The number of YouTube videos that are out with people singing to him, and the number of hits these videos are getting begs to question the real motive behind this type of “free advertisement”. I don’t particularly agree with all that is presented in this movie, but the song does kind of say it all for me. It just don’t sit right with me, and this is a very subjective assessment on my part. But idolizing another human being is a sure fired way to trouble. Look at the many other cult personalities that have lead people into serious trouble. Again this is subjective. This article is about the political phenomenon. 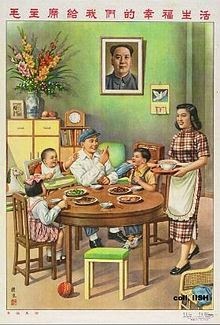 A 1950s Chinese propaganda poster showing a happy family of five enjoying life under the image of Mao Zedong. The caption above the picture reads “The happy life Chairman Mao gives us”. A cult of personality arises when an individual uses mass media, propaganda, or other methods, to create an idealized, heroic, and, at times god-like public image, often through unquestioning flattery and praise. Sociologist Max Weber developed a tripartite classification of authority; the cult of personality holds parallels with what Weber defined as “charismatic authority“. 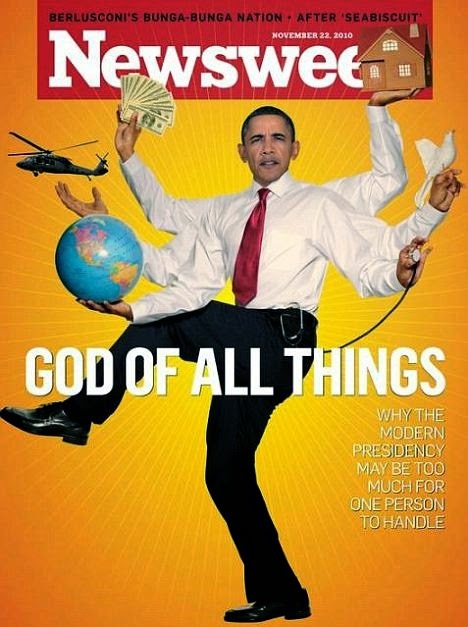 A cult of personality is similar to hero worship, except that it is established by mass media and propaganda. The term Cult of personality or Personality Cult first appeared in Nikita Khrushchev‘s Secret Speech in 1956. Cult of the individual is a more accurate translation. Throughout history, monarchs and heads of state were almost always held in enormous reverence. Through the principle of the divine right of kings, for example, rulers were said to hold office by the will of God. Imperial China (see Mandate of Heaven), ancient Egypt, Japan, the Inca, the Aztecs, Tibet, Thailand, and the Roman Empire (see imperial cult) are especially noted for redefining monarchs as god-kings. The spread of democratic and secular ideas in Europe and North America in the 18th and 19th centuries made it increasingly difficult for monarchs to preserve this aura. However, the subsequent development of photography, sound recording, film, and mass production, as well as public education and techniques used in commercial advertising, enabled political leaders to project a positive image like never before. It was from these circumstances in the 20th century that the best-known personality cults arose. Often these cults are a form of political religion. Personality cults were first described in relation to totalitarian regimes that sought to alter or transform society according to radical ideas. Often, a single leader became associated with this revolutionary transformation, and came to be treated as a benevolent “guide” for the nation without whom the transformation to a better future couldn’t occur. This has been generally the justification for personality cults that arose in totalitarian societies of the 20th century, such as those of Adolf Hitler and Joseph Stalin. Not all dictatorships foster personality cults, not all personality cults are dictatorships (some are nominally democratic), and some leaders may actively seek to minimize their own public adulation. For example, during the Cambodian Khmer Rouge regime, images of dictator Pol Pot (Saloth Sar) were rarely seen in public, and his identity was under dispute abroad until after his fall from power. The same applied to numerous Eastern European Communist regimes following World War II (although not those of Enver Hoxha and Nicolae Ceaușescu, mentioned below). “It is doubtful that anyone ever thought to wear a t-shirt with George Bush’s image splashed across it, except to deride him. Now, wearing the image of the president is not only popular, it has become almost obligatory in some circles. 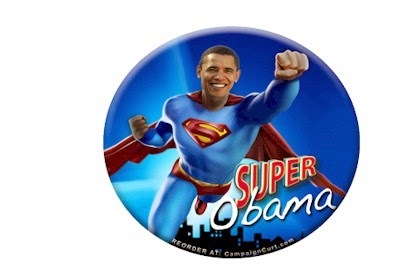 Obama’s image is not just appearing on t-shirts. There are Obama hats, Obama pencil cases, Obama hoodies, Obama screen savers, Obama jewellery, Obama coffee cups and Obama street murals. 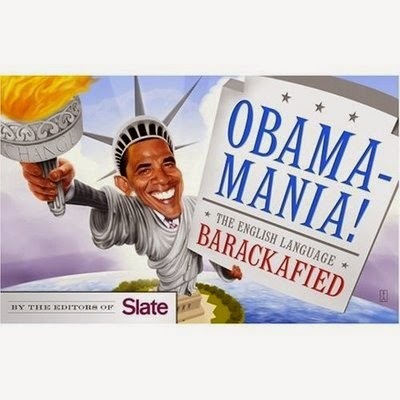 And Obamamania has gone mainstream. Today in DC we can buy metro tickets sporting Obama’s image. Numerous buildings are decorated with huge banners welcoming the new president. Even the National Portrait Galley has got in on the act, snapping up Shepard Fairey’s original collage for the gallery walls long before the new president’s official portrait will be commissioned. “Recently I have noticed an interesting but disturbing phenomenon in New York City. On the streets, subways and buses, you can see people still wearing Barack Obama buttons even though the election is long over. I wonder to myself whether these buttons express an inchoate political/psychological yearning. In some ways it reminds me of how people wore pictures of the fifteen year old guru Maharaj-ji, who counted former 60s radical Rennie Davis as one of his main followers. More from Dorothy:“I honestly don’t know whether to put this in religion or politics. I honestly feel the passion for Senator Obama expressed by most of his followers has equal elements of both – even if they deny it. But I suspect the moderators would move it here to politics if I put it in religion, so here it is in politics. I know this will make many people angry (primarily Obama followers), but I am not looking to debate. 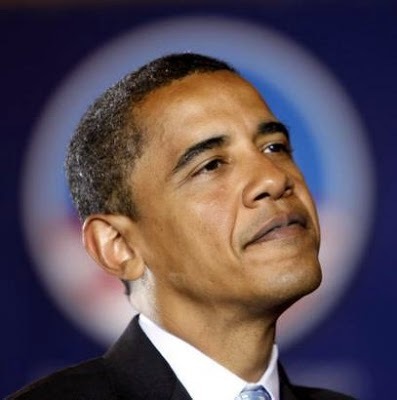 I just wanted to display some of the images of Obama because I find the whole media’s marketing – in this case, just the visual elements- behind the man so fascinating.